You are here: Home / Our Animals / Chickens / Can You Change The Color Of Chicken Egg Yolks? 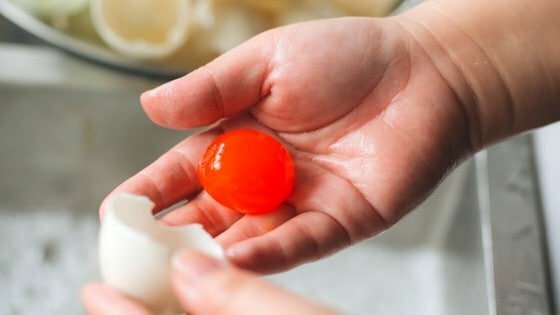 Can You Change The Color Of Chicken Egg Yolks? Ahh…..yolks. They’re pretty much the best part of eating an egg. And as backyard chicken owners, you’re probably in search of the perfect golden yolk. So, can you change the color of chicken egg yolks with diet alone? What else might change the color of chicken yolks? The answer is yes! We do a lot of scientific research to make sure this website is as accurate as possible, and we’ve consistently seen time and again, you can alter the color of chicken egg yolks. According to science, it’s completely possible to change the color of your chicken’s yolks based on her diet. 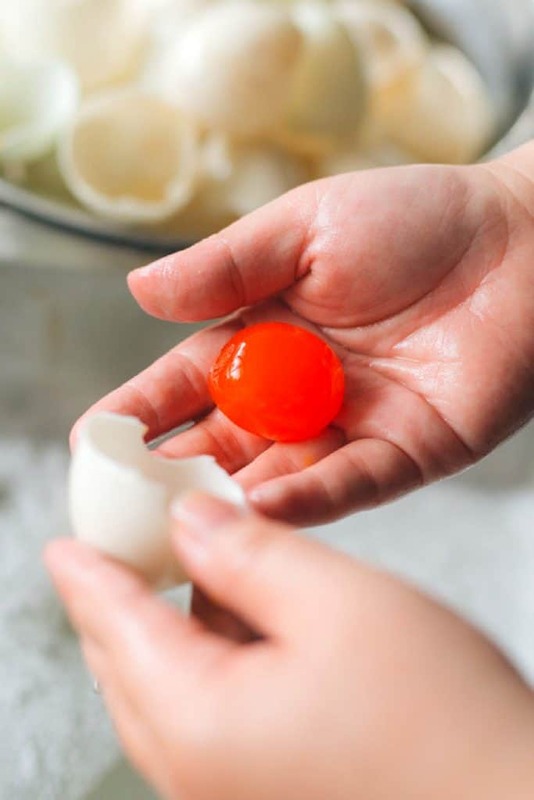 In fact, two chefs were recently interviewed by Food & Wine magazine because their restaurant serves eggs with RED (yes, red) yolks. But before we get into it all, let’s say one thing first: Use these ideas ethically. Just because you CAN cause hot red yolks doesn’t mean you necessarily SHOULD. Will it hurt your chickens? Well, too much of ANYTHING isn’t good, but a sprinkle up to ¼ cup per chicken here or there of herbs will only HELP your flock be healthier. So, have fun with this article, but be judicious and always put the welfare of your chickens first. That being said, there’s ways to change the color of chicken egg yolks using all-natural herbs and foods. Aside from smelling delicious, calendula (botanical name Calendula officinalis) is popular among backyard chicken owners because the beta carotene which gives the flower it’s yellow color can also help your hens lay eggs with golden yolks. It also helps that calendula has lots of vitamins to help your hens be healthier! And chickens love to pick at the pretty yellow petals. If you want to feed calendula to your flock, ¼ cup per chicken in their feed or nesting box is a great idea, and your hens will LOVE it! Chili powder is what famed chefs Dan Barber and Dominique Ansel use to change the color chicken egg yolks bright red, according to their interview in Food & Wine magazine. Chili also has other uses: it’s been shown in studies that the capsaicin might help prevent and/or get rid of worms in chickens. The idea is the worms object to the spicy taste of the chili powder, detach from the hen’s intestines, and are pooped out, breaking the lifecycle of the worms. You can add chili powder to your flock’s or add it to nesting boxes. Tomatoes the fruit are perfectly fine to feed chickens (the leaves & stems are foods that chickens shouldn’t eat! ), and in studies, feeding chickens tomato powder (which is more concentrated) changed the color of the yolks, increasing them from a paler yellow to the more ideal gold. The tomato powder also increased the amount of vitamins in the eggs, particularly the carotenoids and vitamin A! You can feed tomato powder by sprinkling it on your flock’s feed, but just be sure it’s not too much! Yep, our good friend WHITE RICE can actually change the color of chicken egg yolks. But it’s probably not what your looking for – rice can actually turn yolks WHITE. This pretty shocking revelation was discovered by scientists and farmers in Japan, when they switched chickens to a rice based diet after the cost of corn skyrocketed. It apparently didn’t alter the taste of the eggs – with customers calling the eggs light and delicious – and there might even be a market to sell eggs from chickens with rice-based diets. Personally, I wouldn’t feed just rice to my chickens, but they sure do love it as a treat! Just be sure you only feed cooked rice! Well, it’s hard to say since there haven’t been a TON of studies, but look at fruits and veggies. If they use certain vitamins for THEIR color, it’s likely they’ll also change the color of chicken yolks, although it’s impossible to say how much. One example is beets! We all know beets can change the color of human urine and it’s great as a natural easter egg dye, so it’s entirely possible beets might also change the color of chicken yolks (that is, if you can get your chickens to eat it!). In this case, though, I think it’s better to stick to trying to change the color of chicken yolks to a golden yellow with healthy foods such as calendula, rather than “play God” and try to alter nature just for fun. I loved your book…and all you tell me about CHICKENs..thank you…love it!